I’m now thinking how much atenttion hello kitty draws to you… would it be possible that you enjoy it? I guess hello kitty is a bit like paris hilton, you have the VERY scary fanatics and then the people hwo love to hate her the same with hello kitty freaky lonely clinicly deprssed fanatics and us normal people who love to hate her but… does this mean we all secretly love everything todo with hello kitty and could our fraile little minds cope with the end of hello kitty [tempting] that song will be in my head for a decage now. Okay…I read your blog, from august 2006 to now (and am planning to read further) and I stumbled upon this…video. omg. The song is enough to send you into the depths of madness… Well you see…in a way I kinda understand you..I live in Nintendo hell (my little brother) heheh XD but I have to admit… The mario brother theme song is a lot better than this one. My God. That was so awful. I mean, that song was really, really bad. This is… my God. How do you keep your sanity?! And I like hello kitty. That’s a hello kitty fan speaking – not a fanatic one. But that would be too much!!! I’m too curious! Why do you keep a blog like this one?! I found this on google. Dunno if you already have it posted though. Thank god, this video is removed by the user. Just a heads up to the dude running this site. omg i hav a clock somewhat like that!!! 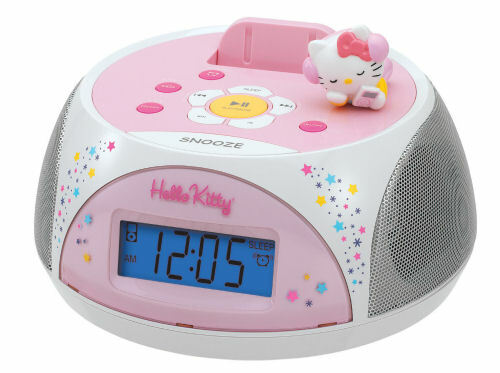 The luxury of uninterrupted sleep looks to be at risk with this Hello Kitty clock at home. I pity you my friend, because the only thing worse than waking up to an irritating alarm is to wake up to a hello kitty song. I haven’t even gotten close to the current pages of your blog… but upon talking with a friend I feel I should warn you that apparently they make HK pads/tampons? If you haven’t already heard of them, consider yourself warned.